This document defines events and related interfaces for handling hardware agnostic pointer input from devices like a mouse, pen, or touchscreen. For compatibility with existing mouse-based content, this specification also describes a mapping to fire [ DOM-LEVEL-3-EVENTS ] Mouse Events for pointer device types other than mouse. This document is based on a previous Member Submission by Microsoft Corporation with changes made based on the consensus of the Working Group. Current bugs and issues are managed in Bugzilla. Action items to be completed are tracked in Tracker. This document was published by the Pointer Events Working Group as a First Public Working Draft. This document is intended to become a W3C Recommendation. If you wish to make comments regarding this document, please send them to public-pointer-events@w3.org (subscribe, archives). All feedback is welcome. Today, most [ HTML5 ] content is used with and/or designed for mouse input. Those that handle input in a custom manner typically code to [ DOM-LEVEL-3-EVENTS ] Mouse Events. Newer computing devices today, however, incorporate other forms of input, like touchscreens or pen input. Event types have been proposed for handling each of these forms of input individually. However, that approach requires a step function in opportunity cost to authors when adding support for a new input type. This often creates a compatibility problem when content is written with only one device type in mind. Additionally, for compatibility with existing mouse-based content, most user agents fire Mouse Events for all input types. This makes it ambiguous whether a Mouse Event represents an actual mouse device or is being produced from another input type for compatibility, which makes it hard to code to both device types simultaneously. To reduce the cost of coding to multiple input types and also to help with the above described ambiguity with Mouse Events, this specifications defines a more abstract form of input, called a pointer. 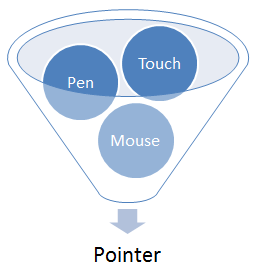 A pointer can be any point of contact on the screen made by a mouse cursor, pen, touch (including multi-touch), or other pointing input device. This model makes it easy to write sites and applications that work well no matter what hardware the user has. For scenarios when device-specific handling is desired, this specification also defines properties for inspecting the device type which produced the event. The primary goal is to provide a single set of events and interfaces that allow for easy authoring for cross-device pointer input while still allowing for device-specific handling when necessary. Fig. 1 A pointer is a hardware agnostic representation of input devices that can target a specific coordinate (or set of coordinates) on a screen. The events for handling generic pointer input look a lot like those for mouse: pointerdown, pointermove, pointerup, pointerover, pointerout, etc. This facilitates easy content migration from Mouse Events to Pointer Events. Pointer Events provide all the usual properties present in Mouse Events (client coordinates, target element, button states, etc.) in addition to new properties for other forms of input: pressure, contact geometry, tilt, etc. So authors can easily code to Pointer Events and their content just works no matter what input hardware is being used. The key words must, must not, required, should, should not, recommended, may, and optional in this specification are to be interpreted as described in [ RFC2119 ]. A unique identifier for the pointer causing the event. This identifier must be unique from all other active pointers at the time. A user agent may recycle previously retired values for pointerId from previous active pointers, if necessary. If the device producing the event is a mouse, then the pointerId must be 1. Device types other than mouse must not have a pointerId of 1. The width (magnitude on the X axis), in physical screen pixels, of the contact geometry of the pointer. This value may be updated on each event for a given pointer. For devices which have a contact geometry but the actual geometry is not reported by the hardware, a default value may be provided by the user agent to approximate the geometry typical of that pointer type. Otherwise, the value must be 0. The height (magnitude on the Y axis), in physical screen pixels, of the contact geometry of the pointer. This value may be updated on each event for a given pointer. For devices which have a contact geometry but the actual geometry is not reported by the hardware, a default value may be provided by the user agent to approximate the geometry typical of that pointer type. Otherwise, the value must be 0. The normalized pressure of the pointer input in the range of [0,1], where 0 and 1 represent the minimum and maximum pressure the hardware is capable of detecting, respectively. For hardware that does not support pressure, including but not limited to mouse, the value must be 1 when in the active buttons state and 0 otherwise. The plane angle (in degrees, in the range of [-90,90]) between the Y-Z plane and the plane containing both the transducer (e.g. pen stylus) axis and the Y axis. A positive tiltX is to the right. 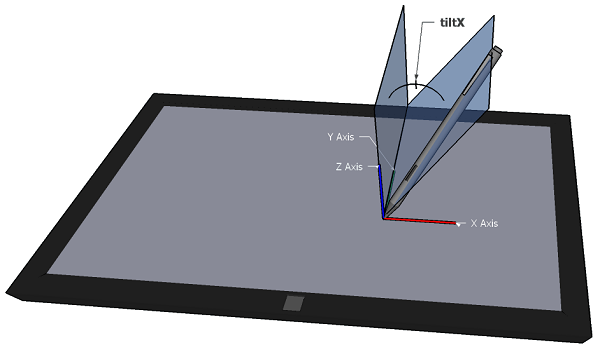 tiltX can be used along with tiltY to represent the tilt away from the normal of a transducer with the digitizer. For devices that do not report tilt, the value must be 0. The plane angle (in degrees, in the range of [-90,90]) between the X-Z plane and the plane containing both the transducer (e.g. pen stylus) axis and the X axis. A positive tiltY is towards the user. tiltY can be used along with tiltX to represent the tilt away from the normal of a transducer with the digitzer. For devices that do not report tilt, the value must be 0. Indicates the device type that caused the event (mouse, pen, touch, etc.). Possible values are defined as constants on the PointerEvent interface. A timestamp, in microseconds, of the pointer event as reported by hardware. The origin time (e.g. hwTimestamp equals 0) is hardware and/or operating system dependent. If the hardware does not provide a high resolution timestamp, then the value must be 0. This value is typically determined by using the hardware's high-resolution performance counter. Indicates if the pointer represents the primary pointer. Value for pointerType when the device type being used cannot be detected by the user agent. Value for pointerType when the device being used can be detected and is a touchscreen. Value for pointerType when the device being used can be detected and is a pen stylus. Value for pointerType when the device being used can be detected and is a mouse. Some pointer devices, such as mouse or pen, support multiple buttons. In the [ DOM-LEVEL-3-EVENTS ] Mouse Event model, each button press produces a mousedown and mouseup event. To better abstract this hardware difference and simplify cross-device input authoring, Pointer Events do not fire overlapping pointerdown and pointerup events for chorded button presses (depressing an additional button while another button on the pointer device is already depressed). In a multi-pointer (e.g. multi-touch) scenario, the primary pointer is used to identify a master pointer amongst the set of active pointers. This pointer is the one that will produce compatibility mouse events. It is also useful when single-pointer interaction is desired by an author. The primary pointer is indicated on events by a value of true for the isPrimary property. The pointer represents a mouse device. The pointer represents a primary touch input. The pointer represents a primary pen input. A pointer representing touch input is considered the primary touch input if its pointerdown event was dispatched when no other active pointers representing touch input existed. A pointer representing pen input is considered the primary pen input if its pointerdown event was dispatched when no other active pointers representing pen input existed. In some platforms, the primary pointer is determined using all active pointers on the device including those not targeted at the user agent (e.g. in another application). This means it is possible for the user agent to fire pointer events in which no pointer is marked as the primary pointer. For example, if the first touch interaction is targeted outside the user agent and a secondary (multi-touch) touch interaction is targeted inside the user agent, then the user agent fires pointer events for the second contact with a value of false for isPrimary. The following table provides a summary of the event types defined in this specification. A user agent must dispatch this event when a pointer enters the active buttons state. For mouse, this is when the the device transitions from no buttons depressed to at least one button depressed. For touch, this is when physical contact is made with the digitizer. For pen, this is when the stylus makes physical contact with the digitizer. For input devices that do not support hover, a user agent must also fire a pointerover event proceeding the pointerdown event. For mouse (or other multi-button pointer devices), this means pointerdown and pointerup are dispatched differently than mousedown and mouseup. See chorded buttons for more information. A user agent must dispatch this event when a pointer leaves the active buttons state. For mouse, this is when the the device transitions from at least one button depressed to no buttons depressed. For touch, this is when physical contact is removed from the digitizer. For pen, this is when the pen is removed from physical contact with the digitizer. For input devices that do not support hover, a user agent must also fire a pointerout event after firing the pointerup event. The user agent has determined that a pointer is unlikely to continue to produce events (for example, because of a hardware event). After having fired the pointerdown event, the pointer is subsequently used to manipulate the page viewport (e.g. panning or zooming). A user agent must also fire a pointerout event after firing the pointercancel event. A device's screen orientation is changed while a pointer is active. The user inputs a greater number of simultaneous pointers than is supported by the device. The user agent interprets the input as accidental (for example, the hardware supports palm rejection). Methods for changing the device’s screen orientation, recognizing accidental input, or using a pointer to manipulate the viewport (e.g. panning or zooming) are out of scope for this specification. A user agent must dispatch this event when a pointer changes coordinates, button state, pressure, tilt, or contact geometry (e.g. width and height). A user agent must dispatch this event when a pointing device is moved into the hit test boundaries of an element. A user agent must also dispatch this event prior to a pointerdown event for devices that do not support hover. A user agent must dispatch this event when a pointing device is moved into the hit test boundaries of an element or one of its descendants, including as a result of a pointerdown event from a device that does not support hover. This event type is similar to pointerover, but differs in that it does not bubble. There are similarities between this event type, the mouseenter event described in [ DOM-LEVEL-3-EVENTS ], and the CSS :hover pseudo-class described in [ CSS21 ]. See also the pointerleave event. A user agent must dispatch this event when a pointing device is moved off of the hit test boundaries of an element and all of its descendants, including as a result of a pointerup event from a device that does not support hover. This event type is similar to pointerout, but differs in that it does not bubble and that it must not be dispatched until the pointing device has left the boundaries of the element and the boundaries of all of its children. There are similarities between this event type, the mouseleave event described in [ DOM-LEVEL-3-EVENTS ], and the CSS :hover pseudo-class described in [ CSS21 ]. See also the pointerenter event. A user agent must dispatch this event prior to dispatching the first event after pointer capture is set for a pointer. This event is dispatched to the element that is receiving pointer capture. Subsequent events for that pointer will be dispatched to this element. See setPointerCapture(). A user agent must dispatch this event after pointer capture is released for a pointer. This event must be dispatched prior to any subsequent events for the pointer after capture was released. This event is dispatched to the element from which pointer capture was removed. Subsequent events for the pointer follow normal hit testing mechanisms (out of scope for this specification) for determining the event target. See releasePointerCapture(). The event handler IDL attribute (see [ HTML5 ]) for the pointerdown event type. The event handler IDL attribute (see [ HTML5 ]) for the pointermove event type. The event handler IDL attribute (see [ HTML5 ]) for the pointerup event type. The event handler IDL attribute (see [ HTML5 ]) for the pointercancel event type. The event handler IDL attribute (see [ HTML5 ]) for the pointerover event type. The event handler IDL attribute (see [ HTML5 ]) for the pointerout event type. The event handler IDL attribute (see [ HTML5 ]) for the pointerenter event type. The event handler IDL attribute (see [ HTML5 ]) for the pointerleave event type. The event handler IDL attribute (see [ HTML5 ]) for the gotpointercapture event type. The event handler IDL attribute (see [ HTML5 ]) for the lostpointercapture event type. Sets pointer capture for the pointer identified by the argument pointerId to the element on which this method is invoked. Subsequent events for the pointer must always be targeted at this element. Releases pointer capture for the pointer identified by the argument pointerId from the element on which this method is invoked. Subsequent events for the pointer follow normal hit testing mechanisms (out of scope for this specification) for determining the event target. The Navigator interface is defined in [ HTML5 ]. This specification extends the Navigator interface to provide device and feature detection support. Indicates if the browser will fire pointer events for pointing input. The maximum number of simultaneous touch contacts supported by the device. In the case of devices with multiple digitizers (e.g. multiple touchscreens), the value must be the maximum of the set of maximum supported contacts by each individual digitizer. For example, suppose a device has 3 touchscreens, which support 2, 5, and 10 simultaneous touch contacts, respectively. The value of maxTouchPoints is 10. For touch input, the default action of any and all pointer events must not be a manipulation of the viewport (e.g. panning or zooming). Touch manipulations are intentionally not a default action of pointer events. Removing this dependency on the cancellation of events facilitates performance optimizations by the user agent. The touch-action CSS property determines whether touch input may trigger default behavior supplied by user agent. This includes, but is not limited to, behaviors such as panning or zooming. The user agent may determine the permitted touch behaviors, such as panning and zooming manipulations of the viewport, for touches that begin on the element. Touches that begin on the element must not trigger default touch behaviors. The property takes the same specified value as the property for the element's parent. a pointerup or pointercancel event (following the above mentioned pointerdown) has not yet been sent for the pointer. During the execution of the behavior (after sending the pointercancel and pointerout events), the user agent must not dispatch subsequent pointer events for the pointer. Pointer capture allows the events for a particular pointer to be retargeted to a particular element other than the normal hit-test result of the pointer's location. This is useful in scenarios like a custom slider control (e.g. similar to the [ HTML5 ] <input type="range"> control). Pointer capture can be set on the slider thumb element, allowing the user to slide the control back and forth even if the pointer slides off of the thumb. Fig. 4 Example of a custom slider control that chooses a value by sliding the thumb element back and forth. After pointerdown on the thumb, pointer capture can be used to allow the user to slide the thumb even if the pointer drifts off of it. If the pointerId provided as the method's argument does not match any of the active pointers, then throw a DOMException with the name InvalidPointerId. If the pointer is not in the active buttons state, then terminate these steps. Until pointer capture is released, set the target property of all future pointer and compatibility mouse events for the specified pointerId to the Element on which this method was invoked. Until pointer capture is released, set the relatedTarget property of all future pointer and compatibility mouse events for the specified pointerId to null. Fire a gotpointercapture event at the Element on which this method was invoked. If pointer capture is not currently set for the specified pointer, then terminate these steps. For all future pointer and compatibility mouse events for the specified pointerId, resume setting the target property to the hit-test results (out of scope for this specification) for the pointer. Fire a lostpointercapture event at the Element on which this method was invoked. Immediately after firing the pointerup event, a user agent must run the steps as if the releasePointerCapture() method has been called with an argument equal to the pointerId property of the pointerup event just dispatched. The vast majority of web content existing today codes only to Mouse Events. The following describes the algorithm for how a user agent may map generic pointer input to mouse events for compatibility with this content. Unless otherwise noted, the target of any mapped mouse event may be the same as the target for the pointer event from which it was mapped. Authors can prevent the production of compatibility mouse events by cancelling the pointerdown event. The compatibility mapping with mouse events are an optional feature of this specification. User agents are encouraged to support the feature for best compatibility with existing legacy content. User agents that do not support compatibility mouse events are still encouraged to support the click event (see the note below). The click event is defined in [ DOM-LEVEL-3-EVENTS ] and is not considered a compatibility mouse event as it is typically tied to user interface activation. In user agents that support firing click, calling preventDefault during a pointer event typically does not have an effect on whether click is fired or not. Because it is not a compatibility mouse event, user agents typically fire click for all pointing devices, including pointers that are not primary pointers. If the isPrimary property for the pointer event to be dispatched is false then dispatch the pointer event and terminate these steps. If the pointer event dispatched was pointerdown and the event was cancelled, then set the PREVENT MOUSE EVENT flag. if the pointer has been moved onto the boundaries of an element or one of its descendants then dispatch a mouseenter event. if the pointer has been moved out of the boundaries of an element and all of its descendants then dispatch a mouseleave event. pointerdown, then dispatch a mousedown event. pointermove, then dispatch a mousemove event. pointerup, then dispatch a mouseup event. pointercancel, then dispatch a mouseup event at the window. If the pointer event dispatched was pointerup or pointercancel, clear the PREVENT MOUSE EVENT flag. Mouse events can only be prevented when the pointer is down. Hovering pointers (e.g. a mouse with no buttons pressed) cannot have their mouse events prevented. And, the mouseover and mouseout events are never prevented (even if the pointer is down). If the pointer event to be dispatched is pointerover and the pointerdown event has not yet been dispatched for this pointer, then dispatch a mousemove event. The following are example author code that demonstrates how the APIs in this specification might be used. The condition when a pointer has a non-zero value for the buttons property. For mouse, this is when the device has at least one button depressed. For touch, this is when there is physical contact with the digitizer. For pen, this is when the pen has physical contact with the digitizer. A mouse connected to the device is always active. A touch contact on the screen is considered active. If a touch contact or pen stylus is lifted beyond the range of the digitizer, then it is no longer considered active. In some platforms, the set of active pointers includes all pointer input to the device, including any that are not targeted at the user agent (e.g. another application). An event whose default action was prevented by means of preventDefault(), returning false in an event handler, or other means as defined by [ DOM-LEVEL-3-EVENTS ] and [ HTML5 ]. The bounding box of an input (most commonly, touch) on a digitizer. This typically refers to devices with coarser pointer input resolution than a single pixel. Some devices do not report this data at all. A type of input sensing device in which a surface can detect input which is in contact and/or in close proximity. Most commonly, this is the surface that sense input from touch contact or a pen stylus. 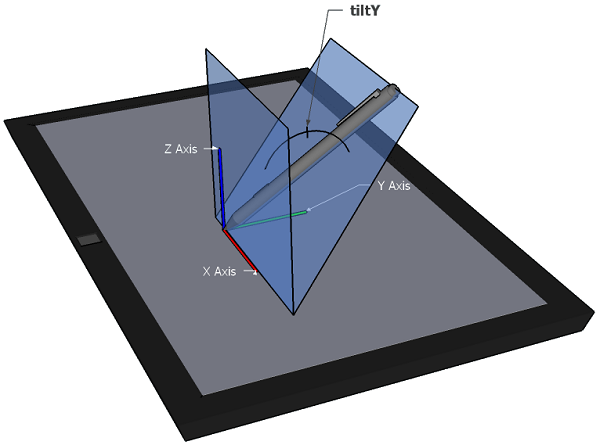 A hardware agnostic representation of input devices that can target a specific coordinate (or set of coordinates) on a screen, such as a mouse, pen, or touch contact. A program, such as a browser or content authoring tool, normally running on a client machine, which acts on a user's behalf in retrieving, interpreting, executing, presenting, or creating content. Many thanks to lots of people for their proposals and recommendations, some of which are incorporated into this document. Special thanks to those that helped pioneer the first edition of this model, including especially: Charu Chandiram, Peter Freiling, Nathan Furtwangler, Thomas Olsen, Matt Rakow, Ramu Ramanathan, Justin Rogers, Jacob Rossi, Reed Townsend, Steve Wright.